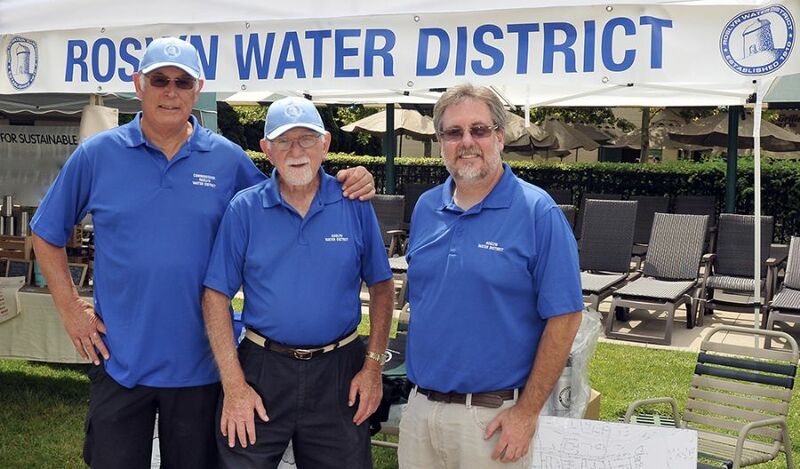 On August 25th, the Roslyn Water District brought its message of conservation to “East Hills Green Day”, a special event dedicated to informing area residents about products and services that benefit the environment. Roslyn Water Commissioners Michael J. Kosinski and Dr. Sanford Klein were on hand at the event to discuss the many merits of water conservation and sustainability. The District’s “Save 2 Minutes”, a voluntary public services program initiated in 2015, was chief among the topics. The “Save 2 Minutes” program is designed to conserve up to 10% of the Roslyn Water District’s annual irrigation water. Participating residents reduce the time that each of their irrigation zones are turned on by two minutes. Another successful program the commissioners discussed was staggering of irrigation by community. The various communities served by the District have varied windows of time that they may irrigate. The District found that this produced dramatic improvements in water availability during times of peak demand. Left to right: Commissioner Michael J. Kosinski; Commissioner Sanford E. Klein DDS; Roslyn Water District Superintendent Richard J. Passariello.